Wouldn't this be rad for a wedding? Perhaps at the zoo? Visit Tigers to Lilies for a how-to (ish). I think she's gonna be one of my new faves. We almost did those for our wedding! I love them. Especially with the elephant inside. Genius. why didn't i think of the elephant? so good. how unique and inventive! very cool! 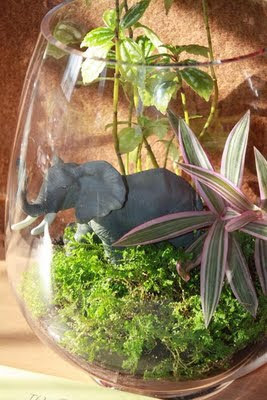 great idea and a great update on the whole terranium trend. thanks for sharing!